Social media . . . oh no! I've already lost some of you. Come back—I swear this won't be overwhelming! Here at Commonwealth, we recommend social media for busy financial advisors. Why? In short, it works. When first starting social media marketing, many advisors ask, "Exactly how much time should I dedicate to social media?" or, "What can others in my office do to help?" These are great questions! Just like any other marketing strategy, social media takes time—and a smart approach. It doesn't, however, have to become a drain on your time. In fact, it doesn't need to take up more than an hour or two per day (although it may at one point or another), especially when you first begin. We believe it's best to take things slow and recommend breaking down your efforts into small "digestible" pieces so it's not overwhelming—three 20-minute sessions per day, for example. This way, you're more likely to make social media a part of your daily routine and a highly efficient and effective way to market your services. We also encourage advisors to enlist the help of others where possible. There are certain processes that you should oversee, but many other tasks can be delegated. Not only will this help make things easier for you, but your social media marketing may improve when it's managed by a dedicated, knowledgeable staff member. Before you can leverage social media, you need to articulate your specific objectives first. Are you looking to strengthen relationships or are you more focused on professional networking? Or maybe it's a little of both? Bear in mind that your objectives may change over time—and that's a good thing! Once your objectives are defined, you can determine which sites will best help you reach your goals. Next, develop a plan, break down the tasks, and determine who will complete what—and when—to help reach your goals efficiently. Now that you have a plan in place, you can set up your profiles. It's important to accurately convey your unique personality, philosophies, and experiences. You can, however, solicit others in your office to put the information together and create the profiles, once you approve the content. Social media is a great tool for financial advisors when you frequently and consistently post relevant, interesting content. Luckily, your entire office can help generate ideas and contribute posts. This will help to keep the content fresh. Be sure to include your unique thoughts and opinions so your readers will get to know you—and grow to see you as a trusted expert. Many advisors find it convenient to set aside a few minutes during a regularly scheduled meeting to review posts for the upcoming week, so it's not a daily task. Never hesitate to post an article to your website and share the link across different profiles or accounts. This strategy engages your followers—and also drives traffic to your website. We recommend appointing a "point person" on your staff to oversee all your accounts and posts. This helps ensure that all content adheres to compliance rules, promotes your specific business, and is published consistently. Also, you may consider experimenting with some shortcuts for distributing content. Add icons to your website and e-mail signature that direct traffic to your blog and social media profiles. Announce your new social media profiles to your friends, clients, and prospects. Invite them to connect with you online. Connecting with new followers will vary across different social media platforms. Tailor your efforts for LinkedIn, Twitter, and your other networks. The purpose of social media is to engage with an audience that's interested in your services. Every time you receive a comment, acknowledge it with a response. This demonstrates your accessibility and openness to discussion, as well as helps solidify your status as an expert in the field. At Commonwealth, we like to say "engagement breeds engagement." Once people notice your participation, they'll be much more likely to engage with you in the future. Monitor your social media marketing efforts by tracking the number of likes, comments, shares, and other data. We recommend financial advisors use Google Analytics. Again, this can be set up and monitored by a member of your team. Once you've collected the data, review the information and refine your social media strategy accordingly. 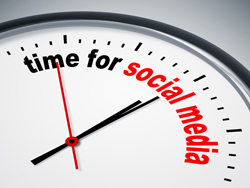 There's no magic formula for how much time you should spend on social media. It depends on you, your unique goals, and your specific business. By breaking down the process into manageable steps—and delegating whenever possible—it doesn't have to take up your entire day! Do you have any tips when it comes to social media for busy financial advisors? Comment below to share.